A hand is a prehensile, multi-fingered appendage located at the end of the forearm or forelimb of primates such as humans, chimpanzees, monkeys, and lemurs. A few other vertebrates such as the koala (which has two opposable thumbs on each "hand" and fingerprints extremely similar to human fingerprints) are often described as having "hands" instead of paws on their front limbs. The raccoon is usually described as having "hands" though opposable thumbs are lacking. The human hand normally has five digits: four fingers plus one thumb; these are often referred to collectively as five fingers, however, whereby the thumb is included as one of the fingers. It has 27 bones, not including the sesamoid bone, the number of which varies between people, 14 of which are the phalanges (proximal, intermediate and distal) of the fingers and thumb. The metacarpal bones connect the fingers and the carpal bones of the wrist. Each human hand has five metacarpals and eight carpal bones. Among humans, the hands play an important function in body language and sign language. Likewise the ten digits of two hands, and the twelve phalanges of four fingers (touchable by the thumb) have given rise to number systems and calculation techniques. An adult human male's hand weighs about a pound. The skeleton of the human hand consists of 27 bones: the eight short carpal bones of the wrist are organized into a proximal row (scaphoid, lunate, triquetral and pisiform) which articulates with the bones of the forearm, and a distal row (trapezium, trapezoid, capitate and hamate), which articulates with the bases of the five metacarpal bones of the hand. The heads of the metacarpals will each in turn articulate with the bases of the proximal phalanx of the fingers and thumb. These articulations with the fingers are the metacarpophalangeal joints known as the knuckles. At the palmar aspect of the first metacarpophalangeal joints are small, almost spherical bones called the sesamoid bones. The fourteen phalanges make up the fingers and thumb, and are numbered I-V (thumb to little finger) when the hand is viewed from an anatomical position (palm up). 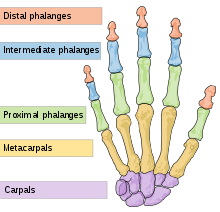 The four fingers each consist of three phalanx bones: proximal, middle, and distal. The thumb only consists of a proximal and distal phalanx. Together with the phalanges of the fingers and thumb these metacarpal bones form five rays or poly-articulated chains. The radial nerve supplies the finger extensors and the thumb abductor, thus the muscles that extends at the wrist and metacarpophalangeal joints (knuckles); and that abducts and extends the thumb. The median nerve supplies the flexors of the wrist and digits, the abductors and opponens of the thumb, the first and second lumbrical. 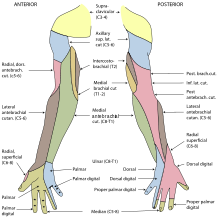 The ulnar nerve supplies the remaining intrinsic muscles of the hand. The radial nerve supplies the skin on the back of the hand from the thumb to the ring finger and the dorsal aspects of the index, middle, and half ring fingers as far as the proximal interphalangeal joints. 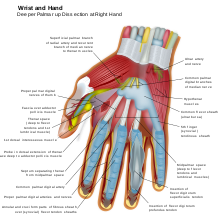 The median nerve supplies the palmar side of the thumb, index, middle, and half ring fingers. Dorsal branches innervates the distal phalanges of the index, middle, and half ring fingers. The ulnar nerve supplies the ulnar third of the hand, both at the palm and the back of the hand, and the little and half ring fingers. The web of the hand is a "fold of skin which connects the digits". These webs, located between each set of digits, are known as skin folds (interdigital folds or plica interdigitalis). 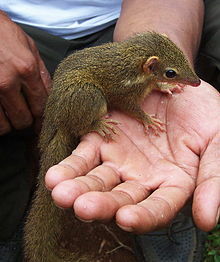 They are defined as "one of the folds of skin, or rudimentary web, between the fingers and toes". 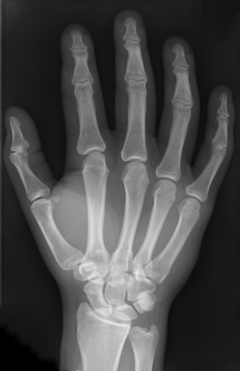 X-ray of the left hand of a ten-year-old boy with polydactyly. Hard hands of a young girl in Algeria. Palmistry – fortune-telling based on lines in hand palms. Mudra – Hindu term for hand gestures. ^ Thomas, Dorcas MacClintock ; illustrated by J. Sharkey (2002). A natural history of raccoons. Caldwell, N.J.: Blackburn Press. p. 15. ISBN 978-1-930665-67-5. ^ a b Mark L. Latash (18 March 2008). Synergy. Oxford University Press, USA. pp. 137–. ISBN 978-0-19-533316-9. ^ Tracy L. Kivell; Pierre Lemelin; Brian G. Richmond; Daniel Schmitt (10 August 2016). The Evolution of the Primate Hand: Anatomical, Developmental, Functional, and Paleontological Evidence. Springer. pp. 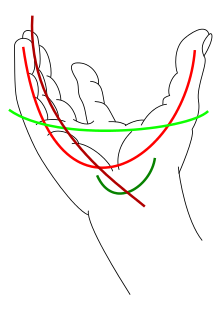 7–. ISBN 978-1-4939-3646-5. ^ Goldfinger, Eliot (1991). Human Anatomy for Artists : The Elements of Form: The Elements of Form. Oxford University Press. pp. 177, 295. ^ O'Rahilly, Ronan; Müller, Fabiola (1983). Basic Human Anatomy: A Regional Study of Human Structure. Saunders. p. 93. ^ "ExRx.net : Body Segment Data". www.exrx.net. ^ "Medical mnemonics". LifeHugger. Archived from the original on 2011-07-13. Retrieved 2009-12-19. ^ "web of fingers/ toes". Farlex Medical Dictionary. Farlex Partner Medical Dictionary. Retrieved 14 March 2016. Almécija, Sergio (2009). "Evolution of the hand in Miocene apes: implications for the appearance of the human hand (PhD Thesis)" (PDF). Universitat Autònoma de Barcelona. Austin, Noelle M. (2005). "Chapter 9: The Wrist and Hand Complex". In Levangie, Pamela K.; Norkin, Cynthia C. (eds.). Joint Structure and Function: A Comprehensive Analysis (4th ed.). Philadelphia: F. A. Davis Company. ISBN 978-0-8036-1191-7. Flanagan, J Randall; Johansson, Roland S (2002). "Hand Movements" (PDF). Encyclopedia of the human brain. Elsevier Science. Jones, Lynette A.; Lederman, Susan J. (2006). "Structure of the Skin". Human hand function. Oxford University Press. ISBN 978-0-19-517315-4. Kivella, Tracy L.; Schmitt, Daniel (August 25, 2009). "Independent evolution of knuckle-walking in African apes shows that humans did not evolve from a knuckle-walking ancestor". PNAS. 106 (34): 14241–14246. Bibcode:2009PNAS..10614241K. doi:10.1073/pnas.0901280106. PMC 2732797. PMID 19667206. Knight, Kathryn (2012). "Fighting Shaped Human Hands". The Journal of Experimental Biology. 216 (2): i.1–i. doi:10.1242/jeb.083725. Lovejoy, C. Owen; Suwa, Gen; Simpson, Scott W.; Matternes, Jay H.; White, Tim D. (October 2009). "The Great Divides: Ardipithecus ramidus Reveals the Postcrania of Our Last Common Ancestors with African Apes". Science. 326 (5949): 73, 100–106. Bibcode:2009Sci...326..100L. doi:10.1126/science.1175833. PMID 19810199. Marieb, Elaine N (2004). Human Anatomy & Physiology (Sixth ed.). Pearson PLC. ISBN 978-0-321-20413-4. Marzke, Mary. "Evolution of the hand and bipedality". Massey University, NZ. Retrieved September 21, 2017. Morgan, Michael H.; Carrier, David R. (January 2013). "Protective buttressing of the human fist and the evolution of hominin hands". J Exp Biol. 216 (2): 236–244. doi:10.1242/jeb.075713. PMID 23255192. Reardon, Sara (December 19, 2012). "Human hands evolved so we could punch each other". New Scientist. Retrieved September 21, 2017. Ross, Lawrence M.; Lamperti, Edward D., eds. (2006). Thieme Atlas of Anatomy: General Anatomy and Musculoskeletal System. Thieme. ISBN 978-1-58890-419-5. Schmidt, Hans-Martin; Lanz, Ulrich (2003). Surgical Anatomy of the Hand. Thieme. ISBN 978-1-58890-007-4. Tubiana, Raoul; Thomine, Jean-Michel; Mackin, Evelyn (1998). Examination of the Hand and Wrist (2nd ed.). Taylor & Francis. ISBN 978-1-85317-544-2.